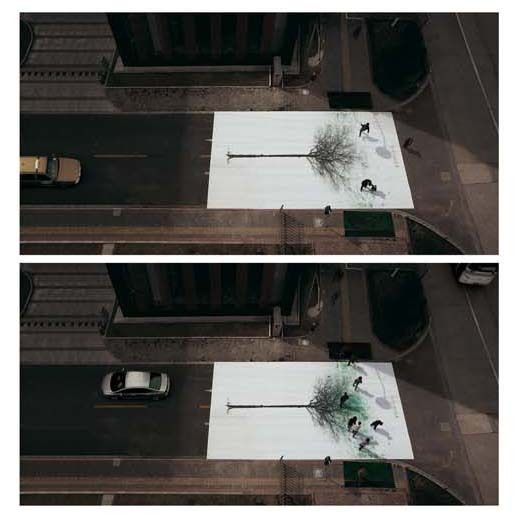 China Environmental Protection Foundation worked with DDB China Group to encourage people to walk more to create a greener environment, using a large canvas featuring a leafless tree. 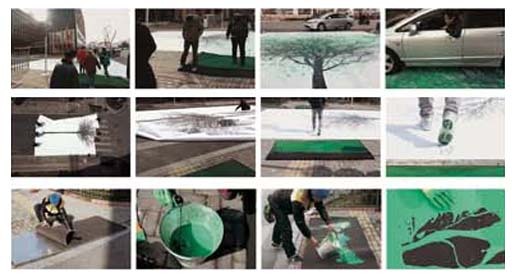 The canvas was placed in the middle of busy pedestrian crossings in Shanghai. On either side of the crossing were sponge cushions soaked in green environmentally-friendly washable and quick dry paint. As pedestrians walked towards the crossing they stepped on the sponges and the soles of their feet made footprints on the tree. Each green footprint added to the canvas like leaves growing on a bare tree. The campaign won a Gold Design Lion at Cannes International Advertising Festival 2010. The Green Pedestrian Crossing was carried out in seven main streets of Shanghai and later expanded to 132 roads in 15 cities across China. Over 3,920,000 people took part in the project. Key media both online and offline rapidly wrote about the campaign. According to research, the overall awareness of environmental protection had increased 86%. After the campaign, the print was exhibited at the Shanghai Zheng Da Art Museum. 40% of carbon monoxide emissions come from cars. According to China’s Ministry of Commerce; the country is now the world’s largest car market with over 500 million vehicles on the road. This is without a doubt having a huge impact on the environment. 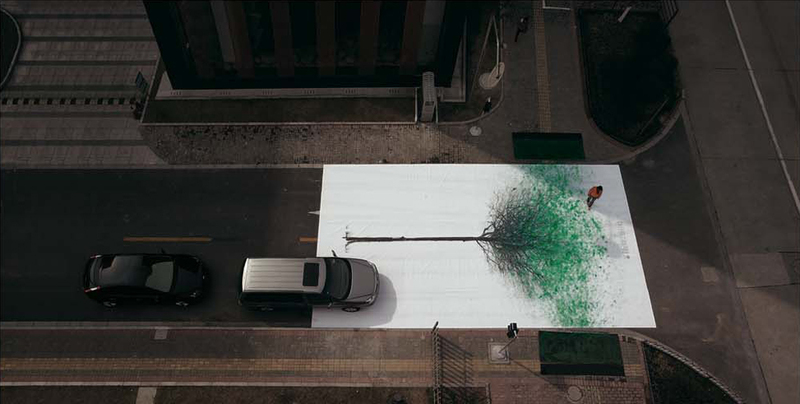 The Green Pedestrian Crossing campaign was developed at DDB China by chief creative officer Michael Dee, creative director/art director/illustrator Jody Xiong, art director Jerry Cao, copywriter Jason Jin, typographer Super Zhang, producer George Ooi, account supervisor Chloe Reuter. Filming was shot by director Qiu Bo via Greenspot Shanghai with producer Gemini Wong. Photographers were Keno Zhao, Refine Images, and King Zhang, WIN Shanghai.